According to the Six Generations of Gales, the sons of Samuel Gale, second of the Six Generations of Gales (the Ashfield Gales), are Anthony Gale (who inherits the main estate at Ashfield in Queen's County, Ireland), Thomas, Henry and John. According to the marriage settlement of 14 November 1780 documented in the Richard Long's memo of 8 May 1967, Thomas Gale, grandfather of Marine Anthony Gale, is a landowner (Sampson's Court) in Queen's County, Ireland in the late 18th Century. According to the Trinity Alumni database [Burtchaell, George Dames and Sadleir, Thomas Ulick (1924). Alumni Databases: a register of the students, graduates, professors and provosts of Trinity College in the University of Dublin. London: Williams And Norgate, p. 315. ], Peter Gale, fourth of the Ashfield Gales, son of Anthony Gale, Generosus, is born Queens County, about 1736. This Peter Gale, Esq., is named as a trustee to the 1780 marriage settlement by Thomas Gale of Sampson's Court on behalf of Anne Delany, wife of Anthony Gale, the second son of Thomas Gale. Thomas Gale would not name a wholly unrelated Gale as a party to this document. Therefore, Peter Gale of Ashfield (who owned a house in the city of Carlow), fourth of the Ashfield Gales, and Thomas Gale of Sampson's Court are related in some manner. Sampson's Court is the subject of a 1737 deed granted by Christmas Paul to Anthony Gale of Crottentegle (the site of the Ashfield estate), the third of the Ashfield Gales. The term of the deed was defined to be during the natural lives of Peter Gale, the fourth of the Ashfield Gales (who was only a year old at the time) and Anthony Gale, second son of Thomas Gale, among others. Since we can safely rule out that there was another Thomas Gale who also had a second son named Anthony who also had a connection to Sampson's Court, the Thomas Gale in this deed must be the same Thomas Gale of Sampson's Court who appears in 14 November 1780 Marriage Settlement. Thomas Gale would later become the principal resident of this Sampson's Court property. In a 1780 Indenture of Lease granted to Thomas Gale of Samsons (sic) Court, farmer, witnessed (among others) by Thomas Gale of Samsons Court, gentleman, the term of the lease is during the life of Peter Gale of Ashfield, Esq. The appearance of Peter Gale of Ashfield, Esq., the fourth of the Ashfield Gales, in this Indenture involving Thomas Gale of Sampsons/Samsons Court establishes still another connection between the Sampson's Court Gales and the Ashfield Gales, further solidifying a family connection between these Gale families. Hence, all of the facts are consistent with the Thomas Gale, identified as a son of Samuel Gale (second of the Ashfield Gales) in Betham's abstract, as being the Thomas Gale of Sampson's Court who is the grandfather of Marine Commandant Anthony Gale. See copy of the 1737 Deed Poll (often used for partitioning land) granted to Anthony Gale and its transcription. See copy of the 1780 Thomas Gale Registered Marriage Settlement and its transcription. See copy of the 1782 Malachy Delany Registered Indenture and its transcription. See copy of the 1773 Malachy Delany Registered Deed and its transcription. See copy of the 1780 Indented Lease to Thomas Gale and its transcription. See copy of the 1808 Marriage Settlement granted by Ensign Thomas Gale and its transcription. According to A Genealogical and Heraldic History of the Landed Gentry of Great Britain & Ireland by Bernard Burke, Samuel Gale, second of the Six Generations of Gales, marries Alicia (Ellis) Grace, whose lineage includes "Sir Oliver Grace, Knt. of Ballylinch and Legau Castles, co. Kilkenny, was Lord of Carney, in Tipperary, and M.P. for that co. in 1559. He m. Mary, dau. of Sir Gerald Fitzgerald, 3rd Lord Decies, by his wife, Ellice, dau. of Pierce Butler, 8th Earl of Ormonde". Accordingly, Commandant Anthony Gale is also a descendant of Edward I, King of England. Therefore, Commandant Anthony Gale is also a descendant of Charlemagne. Connection to Kings of Wales and Britain. Ancestors of Henry III, father of Edward I. Ancestors of Eleanor of Provence, wife of Henry III. 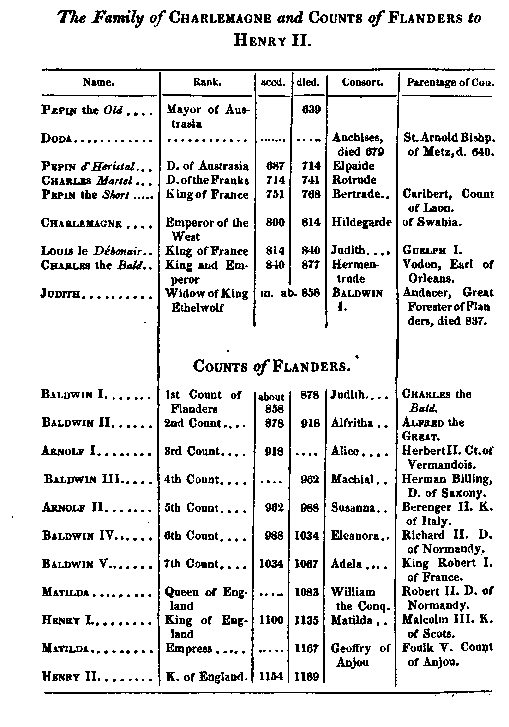 Ancestors of Geoffrey Plantagenet, great-great-grandfather of Edward I, to the Counts of Anjou. Eleanor of Castile, wife of Edward I, is the daughter of Fernando III of Castile. Connection between the Royal Houses of Castile and England. House of Burgundy including Fernando III. Also discusses Duke Robert the Old, son of Robert the Pious and father of Constance (who married Alfonso VI), mother of Queen Urraca. Pope Calixtus II is the brother of Raymond of Burgundy, husband of Queen Urraca. Robert I, Duke of Burgundy and daughter Constance are desendants of Hugh Capet (and descendants of Charlemagne). Ancestors of House of Burgundy to eighth century rulers of Asturias-Leon. Rulers of Asturias-Leon, Navarre, Aragon, Barcelona, Provence, Castile. Pedigree of Isabella of Angouleme, wife of King John. Pedigree of Peter of Courtenay, grandfather of Isabella of Anguoleme. Depicts connection to Florence, Count of Holland, Jarosalv, Duke of Russia, and the Capetian Kings of France. Also shows the mother of Hugh Capet, Hedwig, as the daughter of Henry the Fowler. Further shows the mother of Peter of Courtenay (and wife of King Louis VI) as Adelaide, daughter of Humbert II, Count of Maurienne. Ancestry of Adelaide of Maurienne to Humbert the Whitehanded of the House of Savoy. Ancestry of Henry the Fowler to Charlemagne. Ancestry of Russian Soverigns from Rurik to Yaroslav (Jaroslav). 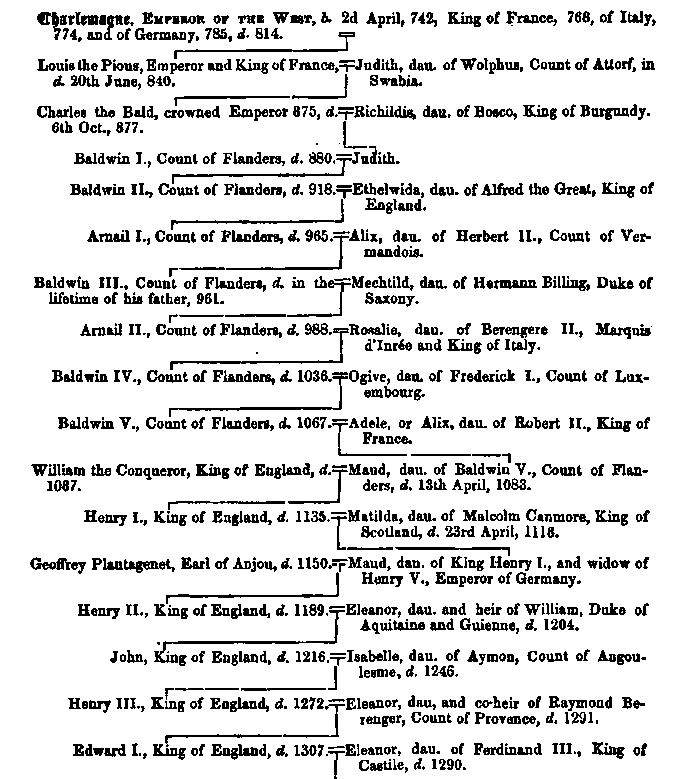 Ancestry of Counts of Holland from Dirk I to Floris (Florence) I.
Matilda, wife of Henry I, is the daughter of Malcolm Canmore (Malcolm III), King of Scotland. Pedigree of Scottish Kings. Margaret, wife of Malcolm III, is descended from the House of Cerdic. 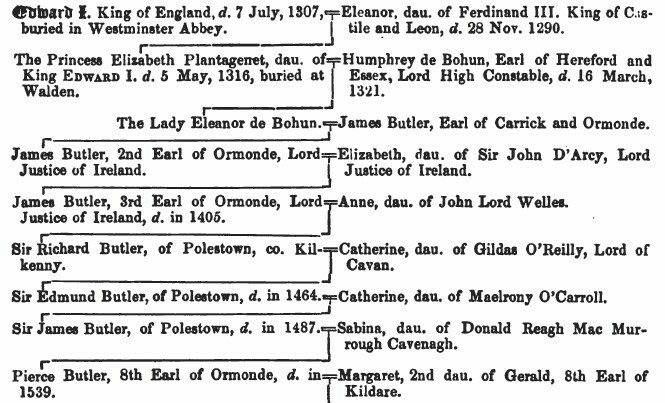 Sources for the above genealogical charts. Composite Chart of the Ancestors of Elizabeth Plantagenet, daughter of Edward I and ancestor of Commandant Anthony Gale. Composite Chart of the Ancestors of Elizabeth Plantagenet removing duplicate ancestors and including certain siblings of ancestors.